Simplicity itself, and tasty enough for company. Waste not, want not. I try to live by that rule. I’m getting better at it but not as good as I would like. It does take some doing to turn what you already have in your refrigerator into something interesting and delicious. Why bring that up you may ask? 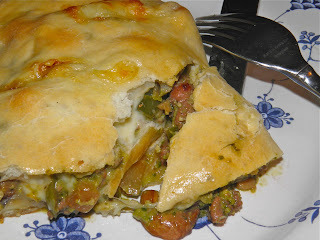 Well, this is the third and last instalment of my recipes about homemade hot Italian sausage. After this my batch is all used up. So I didn’t waste any of it (although there is one piece of pizza and 1/4 of a calzone left in the fridge…). 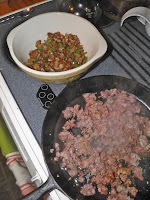 A few posts ago I showed you how easy it was to make your own homemade Italian sausage. 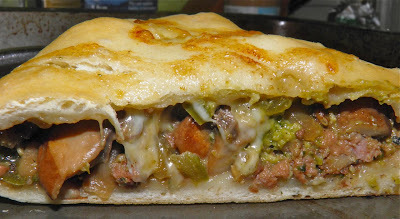 Yesterday I posted a delicious garlic-tomato paste pizza, and today it is calzones (with a twist). 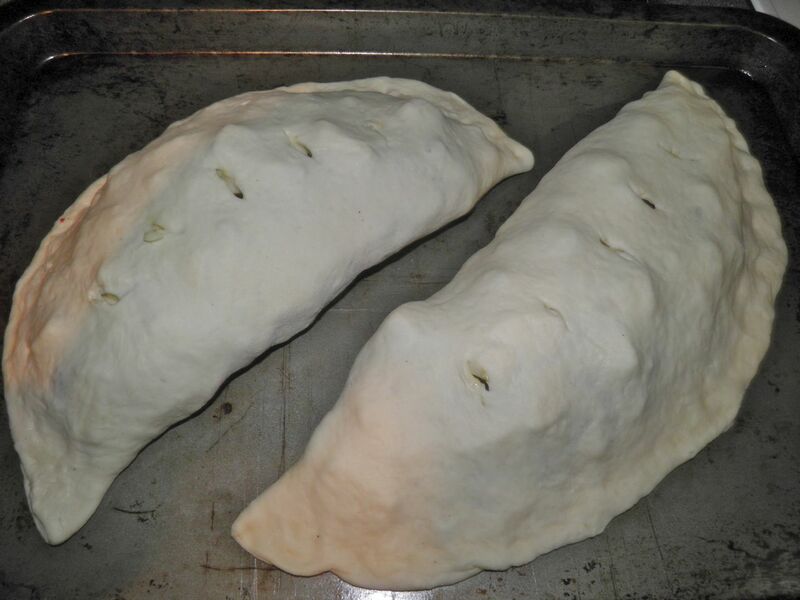 Calzones are rounds of pizza dough which are stuffed, folded over into a crescent, sealed and baked. These differ from panzerotti which are similarly shaped and filled, but deep fried. No extra calories there, right? Of course slightly fatty sausage is not the greatest health-wise itself but you can drain it. At least I know what exactly is in my sausage (since I made it), and I am opting for the baked variety. So that’s somewhat better too. Never one to leave well enough alone, for the “sauce” I made a quasi-pesto using basil, green pepper and walnuts, but no cheese. Varying pesto is quite easy to do. In a post a few months ago I outlined several non-traditional pesto variations. Search “pesto” to find them. So in these calzones there’s no hiding from the basil so you had better like that flavour. 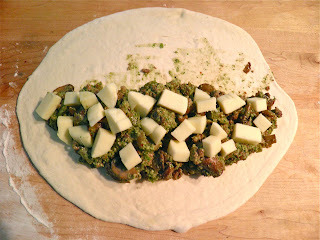 I have tossed the meat and vegetables with the pesto mixture for my filling. Looks great. Tastes even better. Once baked with the melted cheese these are a stand out. You can make the pizza crust ahead if desired and refrigerate. If so make sure you bring it to room temperature before use (takes about 1/2 hour). If making fresh leave enough time in your planning to accomplish whatever method you are using. 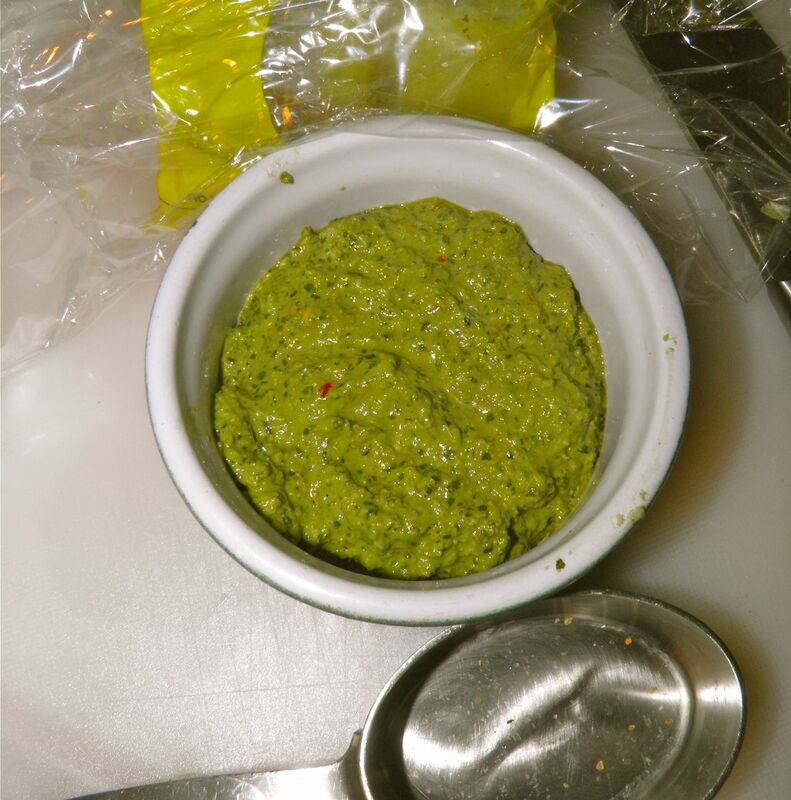 Make the pesto by combining the basil, 1/2 green pepper, walnuts and red pepper flakes in a food processor. Process until fine. With the motor running slowly add in just enough olive oil to make it into a paste. Refrigerate until ready to use. Preheat the oven to 375°F. Sauté the onions, mushrooms and remaining 1/2 green pepper in a little olive oil until they begin to brown. Remove to a bowl. Fry the sausage meat in the same pan. As it cooks break it up into manageable to eat pieces with a wooden spatula. Once the sausage is cooked add it to the vegetables. Sprinkle with salt and pepper and toss well to combine. Mix the pesto in with the sausage meat. Take half of your pizza dough and roll out into a circle capable of holding half of the filling. Spread half the filling down one side, leaving enough room at the ends to easily fold over. Add half of the cubed provolone on top of the meat. Wet the outer edge of the dough with a little water and fold the dough over to make a semi-circle. Pinch well to seal. Repeat with remaining dough, filling and cheese. 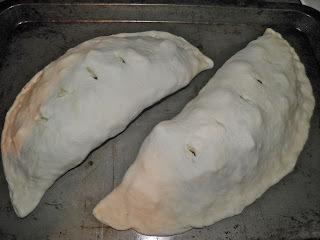 Place the two calzones on a baking sheet, cut a few slits on top to allow steam to escape and bake for 30-35 minutes in the heated oven. Once baked, remove from the oven and allow to cool about 5 minutes. The filling is very hot fresh from the oven. If you do not wait you will burn yourself. I know. Serve with a green salad or any other side accompaniment you wish.